This beautifully modern yet delightfully exotic resort has everything you could wish for from a holiday and more; the fact that the sun shines year-round is simply the icing on the cake! Take a browse around the exclusive marina or a dip in the crystal clear turquoise waters, play a round of golf or maybe a game of tennis. Explore the charming Downtown area, where shaded alleys meander between the fashionable boutiques and art galleries and graceful arches lead through to charming courtyard cafés and bars. When you’re ready for a little pampering, take advantage of the kids’ clubs to keep the children entertained while you head to one of the resort’s beautiful spas. Getting around in El Gouna couldn’t be easier, with a variety of transportation options within the resort, from taxis and ‘Tok Toks’, to regular shuttle buses and taxi boats. There really is so much on offer at El Gouna that every member of the family can be as active or as chilled out as they please. 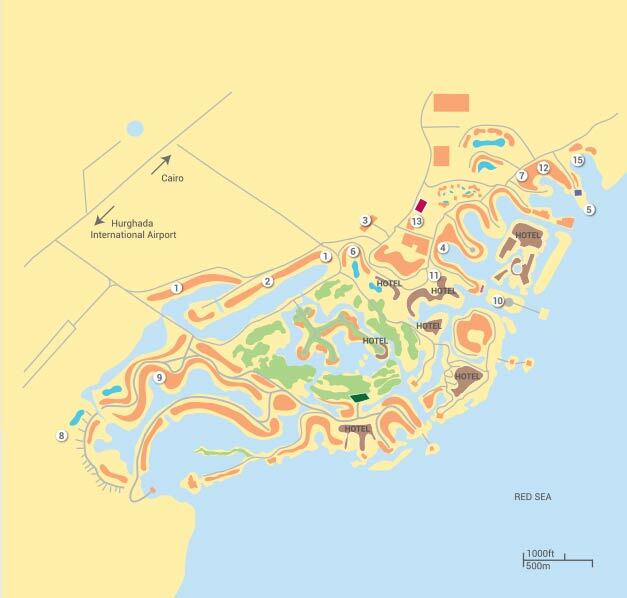 The El Gouna 18-hole golf course is set on a series of islands where tricky lagoons, imaginatively placed bunkers and desert rough lie in wait. Designed to challenge strength and skill at the individual’s own level, with prevailing winds demanding careful reading of the terrain, this year-round course enjoys fabulous views across to the Red Sea and the surrounding mountains. Buggy and equipment hire are available while the driving range and short game area provide the perfect opportunity to improve your handicap! Open all year round, 7 days a week, from 7am - 5pm. Tuition You can book a single golf lesson for €45 or a block of 5 classes for €179 per person. All prices are approximate. Dress code The dress code is shirts with collars and soft spiked shoes only. El Gouna Tennis Club & Academy boasts four excellent clay courts for those looking to make the most of the year-round sunshine to play a few matches or simply perfect their serve. Professional tennis and squash courts are also offered at several of the nearby hotels (Club Med & Movenpick), which can be accessed by James Villa Holidays guests for an extra charge. Approximate costs are 60 EGP per hour. There are additional costs of 35 EGP for hiring a racket and balls and a further 20 EGP to have the court floodlit in the evening. Several of El Gouna’s resort hotels feature their own gym facilities where you can work off that holiday indulgence! Here you will find a range of modern fitness and weights equipment which can be accessed by James Villa Holidays guests for an extra charge. The largest facilities can be found within the Sheraton, Movenpick and Steigenberger Hotels, whilst the ‘LAX’ Gymnasium and Lounge is a new facility which can be found in the New Marina, which also offers state-of-the-art equipment, personal training and fitness classes. Lax Gym, one of the best gyms in El Gouna. Approximate prices are 100 EGP Sunday to Thursday and 150 EGP for Fridays, Saturdays and public holidays. To include gym classes prices are approximately 170 EGP Sunday to Thursday and 255 EGP for Fridays, Saturdays and public holidays. To use the gyms within the hotels the rate is approximately 80 EGP per person per day. Within the resort of El Gouna there is a whole host of different sports and activities available, so there is little chance that you will run out of things to do! Many activities involve water… There is a new inflatable water park which is great fun for all ages! Open every day and fully supervised by qualified staff, this can be found within the White Phase of the resort. Water sports are extremely popular in El Gouna, as well as Kite surfing. Many kite surfing schools can be found in El Gouna, Mangroovy Beach is the perfect location with its shallow waters and excellent winds conditions. Recognised courses for beginners and advance surfers are available with equipment available to hire. El Gouna has many diving and snorkelling centres situated in Downtown and Abu Tig Marina, all offering clients the chance to explore the famous and stunning reefs of the Red Sea. Each centre offers a range of tuition including PADI diving certification, Beginner classes, Professional dives and Snorkelling. One of the best ways to explore El Gouna is to book a boat trip. These make for a lovely day out and will take you around the resorts extensive lagoon network. Back on dry land, Beach volley ball is available at most of the main beaches, there are squash courts at the Movenpick hotel, whilst bike hire is available at Abu Tig Marina and is another fantastic way of exploring the resort. The ‘Cheeky Monkeys’ is a year round amusement facility complete with an indoor air-conditioned playground with trampoline, slides and swings as well as outdoor mini-golf, football pitch and picnic area. Finally, at Downtown, the whole family will enjoy a day out at the delightful Aquarium, or a film at the open-air cinema. Located in two of the resort hotels, the Mövenpick and Steigenberger, El Gouna’s wonderfully luxurious ‘Angsana’ spas offer the ultimate in pampering. While the children have fun in the kids’ club, take the opportunity to revitalise your mind and body with sumptuous treatments influenced by cultures around the world, from sand massages to Turkish baths, aromatherapy to mud wraps. Relaxation guaranteed! Alternatively, if its only a simple beauty treatment which you are after, there are also numerous beauty salons within the Marina, Downtown and the other resort hotels. Many of the hotels within the resort boast indoor and outdoor pools, which can often be used by our customers for an extra charge. These include the Movenpick and Sheraton Hotels. With over 100 restaurants and bars offering everything from spectacular waterfront feasts to intimate candlelit suppers, the range of dining options available at El Gouna is simply unmatched. Whether you opt for sumptuous seafood, exotic Asian food, fine French cuisine or a simple pizza, it’s well worth spoiling yourself with a few meals out during your stay! A wander around Abu Tig Marina, and you will stumble upon a beach bar with great views, an Italian restaurant serving yummy pizzas, a delicious seafood restaurant with romantic ambience facing the sea, an American-style steakhouse with great atmosphere, delicious Belgian cuisine with live piano music, an elegant French restaurant, a gourmet German-Swiss restaurant, an authentic Moroccan restaurant with entertainment in the form of belly-dancers, Scandinavian specialties, mouth-watering sushi, an up-market Champagne bar, and an exotic Vietnamese restaurant to name a few! In Downtown you have a choice of authentic Egyptian cuisine, an Art Café, a wonderful Greek Taverna, tasty Tapas, a Chinese restaurant serving addictive Pekingese and Shanhai cuisine, a fun-filled and lively Sports bar, a couple more Italian restaurants serving superb homemade food, and an appetizing Thai restaurant. There are also numerous bustling coffee shops, snack bars and specialty outlets such as a juice bar, crèperie and fish & chips takeaway! The hotels within El Gouna, also offer a great selection of top-notch restaurants and bars, whilst if it’s a bit of nightlife that you’re after, El Gouna also plays host to a number of great bars and pubs which can be found in both Abu Tig Marina and Downtown. Dependent upon the time of year, you may sometimes find that there is live entertainment in the form of singers and dancers, in Abu Tig Marina and Downtown, as well as street and beach parties. Getting around in El Gouna couldn’t be easier, with a variety of transportation options within the resort, from taxis and ‘Tok Toks’, to regular shuttle buses and taxi boats. If you call ‘0’ from the phone line in your property, you can speak to the operator who will order you a taxi or Tok Tok. You can hop in a Tok Tok for 50 EGP (50p) per person, or there are always plenty of taxis which cost around 200 EGP (£2) per journey. In addition, there are large blue buses which run frequently around the resort, as well two large, colourful and ornate buses, which the president of Pakistan gave to El Gouna as a token of appreciation for the time he enjoyed spending there. Enjoy the vast flavours of the Orient and choose from authentic dishes on their à la carte menu. They offer a special Oriental open buffet every Sunday, accompanied by tea, live music and an array of entertainment. Mamounia offers a vast range of delicious dishes but is renowned its Moroccan cuisine that is a feast for the senses. The world famous couscous and a variety of tagines and authentic Moroccan specialties are enjoyed in a beautifully decorated restaurant on the marina promenade. Dine at El Tableya and enjoy the old fashion lifestyle of Upper Egypt with tasty authentic food, artful décor, comfortable attire, refreshing drinks and playful traditional music. El Tableya is more than a restaurant; it is an experience! Located in the Marina overlooking the water, La Scala servies fresh Italian cuisine, and has tables outside so you can watch the sun set whilst eating. Lavish the flavours of Italy in a romantic candle-lit setting overlooking the glowing landscape. La Piscina has a special Seafood BBQ on Saturdays, and Steak Night every Tuesday and all served to the relaxing melody of a pan flute. Situated in Downtown, White Elephant is a wonderful restaurant serving traditional Thai cuisine. Enjoy Tandoori and Mughalai specialties at the only authentic Indian restaurant in El Gouna. Boasting a top quality French chef, Bleu Bleu specializes in French cuisine served at an ideal location in the Abu Tig Marina. Enjoy a variety of magnificent cuisine and seafood specialty dishes either inside the restaurant or on the marina boardwalk. Located on the marina promenade, Captain's Steakhouse offers an intimate, yet informal, candle-lit setting mere meters from the sea. Their a la carte menu features mouth-watering steaks on sizzling platters, flaming brochettes, seafood and much more! Feast on not only wonderful Belgian culinary delights at their specialty Belgian restaurant but enjoy a fantastic meal of fabulous dishes from all corners of the earth. A wonderful evening, accompanied by soft, live piano music while you dine. The Sail Restaurant offers both international and local delicacies in a sophisticated and relaxed setting. The warm colours and cosy atmosphere the restaurant offers, as well as the friendly service, gives you an unforgettable dining experience. Situated right on the beach front, El Sayadin restaurant is the epitome of romance as you dine while overlooking the sea. Their a la carte menu features fish and seafood specialities, catch of the Day, Lobster Academy, Oriental mezza as well as a BBQ grill. Dining at this floating restaurant located in the new Marina will be a unique culinary experience. Offshore serve Mediterranean cuisine offering a variety of appetizers and local Seafood, accompanied by our locally produced El Gouna wines for that truly authentic touch. Right in the heart of Downtown El Gouna, Dawar El Omda brings you daily themed buffets, from the Atlantic to the Pacific! Highly recommended is Wednesday's 'Taste of Arabia' buffet, offering exotic dishes alongside enchanting Arabian rhythms to indulge all senses. All set amongst an elegant setting of Oriental design. Experience a great evening in an elegant yet cosy restaurant. Daily buffet themes include a uniquely Egyptian fare and traditional dance show on Tuesday evenings. Situated in the scenic Abu Tig marina, at Maritim you can sit and have a breakfast, lunch or dinner and watch an array of stunning million dollar yachts pass by. Their menu is typically international seafood with both vegetarian and other options available. An exciting addition recently made to the restaurant is their Volcanic Rock Grill which now allows diners to grill their own dishes at their table for that truly unique experience. Jobo’s Sports Bar is the local sports bar in El Gouna. It serves a variety of dishes including fajitas and BBQ steaks as well as some more exotic cuisine such as their range of Scandinavian dishes. It also shows sports from around the world broadcasted live on big screen and flat screens throughout the restaurant. Relax on bean bags under umbrellas on the beach with your own waiter service. Delicious food is available at both the restaurant and at the bar, so whether you’re looking for a more formal evening or just to relax and unwind with a cocktail, dining at Moods offers this. If you’re looking for traditional and authentic Greek delicacies then Athena is the place for you. Its welcoming atmosphere gives a great family feel to the restaurant making diners feel at home. You can also enjoy some traditional Greek music and dancing and get involved in some famous Greek plate smashing. In the Downtown area and Abu Tig Marina you’ll find shopping arcades and boutiques, bazaars and galleries selling everything from unusual gifts and discount designer goods to groceries and flowers, perfect for a little leisurely retail therapy. Both Downtown and Abu Tig Marina also have supermarkets which are well-stocked with recognized brands and enable you to pick up all the essentials you require for your holiday. There are plenty of beaches to choose from around El Gouna, so whether you choose to soak up the blissful sun and relax from the comfort of your sun lounger, or snorkel in the warm, clear waters, El Gouna makes for a great beach holiday destination. Mangroovy Beach, located close to the Abu Tig Marina, is one of the most popular beaches for sports activities, such as kite surfing, windsurfing, snorkeling, volleyball and football. It also plays host to beach parties and barbecues during the summer months, and facilities here include towels, washing & changing facilities as well as a restaurant and bar. Buzzha Beach is situated around 15 minutes from downtown and is a lovely quiet retreat. Activities here include billiards, table football, beach volley and there is also a children's playground, all of which are free of charge. Finally, Zeytouna is a beautiful yet lively beach. Located on its own island surrounded by the sea and lagoons, it can be reached by shuttle boat from Downtown and the Sultan Bay Hotel or walk across the bridges from the Sheraton Hotel. This beach has a jetty that provides access to deeper water and the coral reef plateau, perfect for snorkeling. You can take part in camel riding, volleyball and football. Beach facilities include towels, bathroom, shower and snack bar. There is a daily shuttle service running approximately every 20 minutes. Various bars and restaurants in El Gouna offer Wi-Fi internet access for a small charge or for free. Luggage can usually be left in the property on the last day until departure, providing there is not another arrival on the same day. Small problem with the pool was quickly resolved by the local agent. Villa is in a quiet location with easy access to the marina or downtown areas. Would recommend.